Like I mentioned earlier this week, I had a lovely trip to Seattle last weekend--I saw old friends, heard some great panels at MLA, and really enjoyed seeing some of the sights of the city. 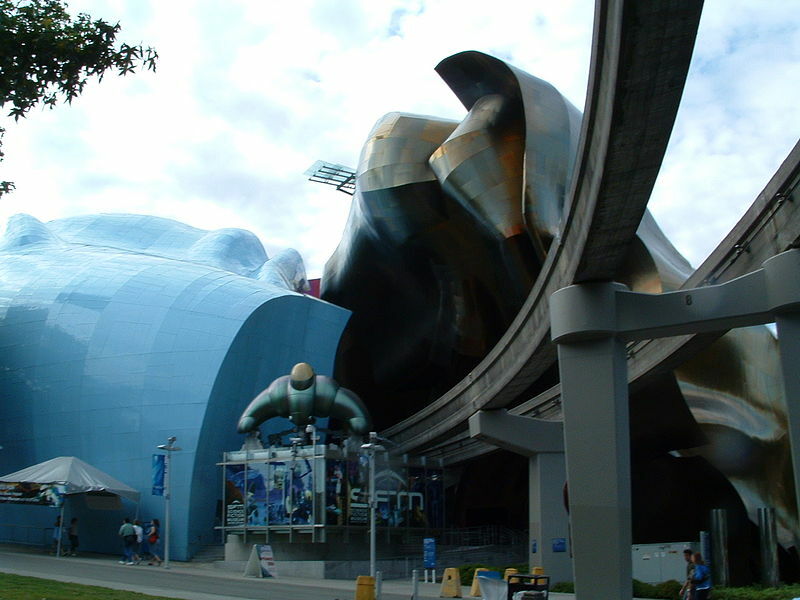 One of the highlights was the EMP Museum, which stands for Experience Music Project. Apparently, it used to be called the Experience Music Project and Science Fiction Museum, or EMP/SFM, which it still is in some guides to Seattle, but the official name on the website and museum literature is just EMP Museum. At any rate, it's a museum dedicated to music, pop culture, and science fiction, so I thought I'd visit. The building itself was designed by Frank Gehry, who designed buildings such as the Walt Disney Concert Hall, the Guggenheim Museum in Bilbao, Spain, and the Dancing House in Prague. The imaginative, creative, and playful quality of many of his works seems quite fitting for a museum dedicated to music, scifi, and pop culture. Once I got inside the museum, I was equally impressed. While I was most interested in the exhibits dedicated to science fiction-related things, I also enjoyed the musical exhibits as well. There is something that looks like a giant tornado made out of 600 guitars called If VI WAS IX: Roots and Branches, created by Seattle artist Trimpin. Many of the guitars are equipped with a mechanism that lets them play by themselves, and you can listen to the music through headphones around the gallery. There were exhibits on Jimi Hendrix and Nirvana, as well as an enormous space called Sky Church, with a giant screen that immerses you in sound and light and creates an almost sacred space within the museum. There is even an exhibit called On Stage that's a high-tech version of Rock Band--yes, I was in a rock band. I sang "I Love Rock and Roll" and played the drums. It was awesome. What I was most interested in, of course, were the science fiction exhibits. The first, called Can't Look Away: The Lure of Horror Films, featured interviews with many famous directors of horror films and screened several classic horror films. I particularly enjoyed the collection of props from famous horror films and TV shows--I was very excited to see Mr. Pointy from Buffy the Vampire Slayer! Having watched most of the first three seasons of the Battlestar Galactica reboot, I was even more excited by the collection of props in Battlestar Galactica: The Exhibition. Not only did I get to see Six's red dress, Baltar's coat, and some Cylon parts, but I also got to see one of the Cylon fighter ships and even Apollo's ship! Some of the props, like Laura Roslin's glasses, did make me wonder though (along lines inspired by Walter Benjamin)--At what point does this become too much? At what point are we saving non-distinctive junk just because it has touched fame? Apart from the appearance of the building itself, my favorite part of the EMP Museum was the Avatar exhibition. In addition to some of the props used in the film, such as Grace's journal, a giant Na'vi arrow, and one of the mech warriors, there were quite a few displays that showed how the filmmakers went about creating the world of Pandora. I was really intrigued by the way that they deliberately drew on images that viewers would be familiar with, and then placed them in unfamiliar contexts to make them seem strange--taking the movement of underwater plants, for example, and using that in plants above ground. I had the chance to put these ideas into action in an exhibit that allowed me to design my own Pandoran plant. I got to pick a root system, stem, and flower, each of which resembled real plants on Earth, and then they were combined into a single, strange-looking creation. Hearing about this design principle--making the familiar strange--did a lot to explain the popularity and appeal of the world of Pandora. There was also quite a bit in the exhibition about the motion-capture technology used to turn actors into the giant blue Na'vi, and one of the highlights for me was the chance to try this out for myself! I was told what to do by (a video of) James Cameron himself, and then my actions were captured and rendered in the form of Neyteri. Here I am, wandering through the forests of Pandora! Finally, while I didn't have time to explore this area fully, there was a treasure trove of information in Sound and Vision: Artists Tell Their Stories, which contained videos of interviews with authors, directors, actors, and musicians, among others. I learned fascinating things about Octavia Butler, heard George Lucas and Steven Spielberg talk about what they think science fiction is, and watched a great interview with the prop guy from the Alien movie. He talked about how they got the alien to pop out of Kane's chest, and even more interestingly, how they tricked the rest of the cast into having genuinely horrified reactions. It was fascinating, and I wish I had had more time to watch these interviews. While the $20 entry fee might seem a bit steep, the wealth of information, particularly in interview form, in the EMP Museum is worth the price of entry alone. Many of the exhibits are also interactive, which is expensive to run and maintain, and this interactivity is another of the major appeals of the museum (it also makes many of the exhibits kid-friendly, which is nice). 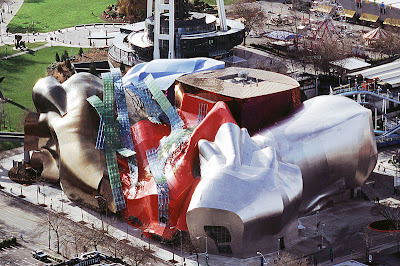 I would highly recommend the EMP Museum to any pop culture/music/scifi fans who visit Seattle.